Entries must be no longer than 90 seconds. Entries must pertain to Dota 2. Entries can use any form or combination of animation or live-action technique in their creation. Using Source Filmmaker is not a requirement. Each entry must be at least 1080p. The deadline for submission will be 04:00:00 PDT on the morning of August 7th, 2018. The submission process must be completed, including uploading the video and filling out submission dialogs, before the submission period ends. Submissions will be reviewed by the Steam community on the Steam Workshop. The top entries will be selected by Valve in its sole discretion to be featured in The International 2018 Battle Pass for a final vote by the Battle Pass community, and the winners will be announced at The International 2018. The video must be a new creation made specifically for the Dota 2 Filmmaker Contest. You are free to use any Valve IP. If you use any non-Valve IP, you must be the copyright owner or have explicit permission from the owner. You will be required to warrant to Valve that you have all necessary rights and permissions in order for the entry to be considered. Any submissions found to be infringing non-Valve IP will be disqualified. Note that for workshop items, you still need to provide a link to the items used, but you do not need explicit permission from the creator, since submission to the workshop automatically grants permission to use the item. Submissions must be free of advertisements. Each of the top submissions will be featured in The International 2018 Battle Pass for a final selection process by the Battle Pass community, and the winning entries will be announced and showcased on the screens and stage of The International 2018. Valve will award $25,000 to 1st place; $10,000 to 2nd place; $5,000 to 3rd place; and $500 to each of the other seven finalists. If your video is selected to appear in The International 2018 Battlepass, you will be contacted via the email address registered to the Steam account(s) linked on the Videos workshop page. How do I upload a submission? Navigate to the Short Film Contest Agreement page	here. Log in and accept the agreement. If you have not yet linked your YouTube account to your Steam Profile, you will need to do so by clicking the 'Link YouTube Account' button in the upper right. Once your YouTube account is linked to your Steam Account, click the 'Add Videos from YouTube' button on your Videos page. Select the Video you want to upload from the list of your YouTube videos, then when asked, select 'Associate the video(s) with a game', and choose 'Dota 2 - Short Film Contest'. Then click the 'Add Video' button. You have now successfully submitted your video to the Dota 2 Short Film Contest. How do I review the video submissions? Help review and discuss the video submissions by going to the Dota 2 Short Film Contest Community page. Other people helped me with my submission. How do I add them as co-authors? Once you've uploaded a submission, it should appear in the videos section of your Steam Community page. From here, simply click on the video; once it pops up, click on 'View Comments and Details' to view Owner Controls and add contributors. 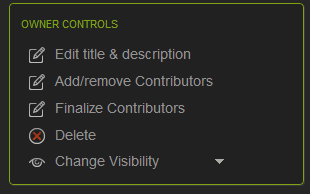 Clicking 'Add/remove Contributors' will pop up a dialog showing you your friends list. Click on friends to select them as co-authors of your submission. Your friends should then receive an email letting them accept or decline whether they are a contributor to the submission. Remember to get your co-authors to accept before the deadline! How do I view previous submissions? You can view The International 2017 submissions here.